Last week I was blessed to attend the Memorial Mass for Vince Peroni. 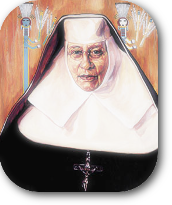 Vince was the husband of our dear sister, Madge Peroni, OFS. The Mass was held in St. Anthony’s church which is a beautiful, beautiful building that is filled with peace. 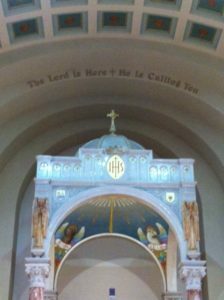 Over the main altar are the phrases: The Lord is here + He is calling you. Sorry – the picture isn’t the best, but it at least gives you an idea. Sitting before Mass and gazing at these words, I knew I wanted to write about them this month. They were speaking to my heart. The Lord is here. We believe in the presence of God everywhere. I believe it, too. But, seeing those words rising high about the tabernacle just meant so much more. The Lord is here. Yes, God is everywhere, but this is His home. He is here. We share a meal with Him here. We come to visit Him here and we take away that love that we get from spending time with a beloved family member. We walk out feeling cherished and cared for. Is God getting the same vibe back from us??? Do we walk into Mass thinking…..I hope this doesn’t go any longer than an hour…I have things to do. What was the Gospel reading today? I dunno…..I was making the grocery list in my head at that time. Hmmm, how can we really be living from Life to Gospel and from Gospel to Life if we can’t give it some attention while it is being proclaimed?! The second phrase….He is calling you…really struck a chord with me. It doesn’t read…He has called you, or He will call you but – He…is…calling…you. He calls you with the joy you experience when you hear from someone who means a great deal to you. He calls you with the patience that says, I know you haven’t answered Me in awhile, but I’m still calling. He stays in touch, even when we don’t. He is calling when we have had a bad day and he is calling when we have had a really great day! When God is calling, we need to make sure He isn’t getting a busy signal! God bless you all!